As anyone who participated with us on Twitter for our Boxing Day Sew-In (#BDSI) may recall, I was sick as a freaking dog that day. I came down with a tremendous cold the Sunday before Christmas (the 18th), and still have it today. Yikes. So I wasn't doing a whole lot of sewing on Sew-In day, but I sure as heck had fun with the conversations and reading everyone's comments on the BDSI blog. It was a hoot! I'll definitely be hosting either another Anti-Black Friday Sew-In or Boxing Day Sew-In again--had too much fun not to! So, who cares that it actually took me three days to finish my BDSI projects? They're done! I had several donation projects to work on. These were all pieced tops and/or orphan blocks that had been donated to our guild over the years for our guild to use for it's own donation projects. How long had they been in storage? Let me just say that one of the tops still had pins in it, and the pins were rusted to the fabric. I had to do some extrication. And some praying that my tetanus shot was still current. Lockjaw aside, I got them done. First up: two pieced tops that were roughly baby quilt size. Like, newborn-baby-just-home-from-the-hospital size. Most babies won't be small enough to use this quilt for long. But that's OK, because by then, they'd be able to see, and who would want to see these? But let me rant later. In short, I'll simply say for now that rather than creating two ugly quilts, I decided to contain the damage and only make one with two ugly sides. Used some strips for binding and batting from my stash, so that all worked out nicely. The other project was the poor little orphan block. Really, she was almost there. Almost cute. But she had some issues, which is how she ended up being a donated orphan block. I suspect many of the issues really came from the fabric that was used. The white is an extremely loose weave and fairly coarse--it didn't want to play nice with the blue print (which was a much higher quality fabric). I puzzled, and puzzled, 'till my puzzler was sore. Turn her into a baby quilt? Nope--I had absolutely nothing in my stash that would work with that particular blue. Turn her into a pillowcase? I put the white fabric to my cheek. Ick. Nope. Finally it dawned on me. A drawstring bag! Lots of places look for drawstring bags--for example, hospice homes like to send personal belongings home for family members in something nicer than a plastic grocery bag. She works nicely for that, although I have some concern about how durable the white fabric is. Probably not a bag for carrying sharp, pointy things. Or rocks. I solved the non-coordinating fabric thing by going patriotic and using a red fat quarter with stars from my stash. Wouldn't be my first choice if I was in a quilt shop, but hey, it works. So, now can I rant? When did we ever get the idea that we can use our ugliest fabric in the most haphazard way or our blocks that clearly didn't work at all and donate them? It's like donating shirts with tears and stains or electronics that don't work or furniture with broken legs and assuming, "Hey, I don't want this piece of junk in my house anymore but someone else will be grateful for it." Yeah, maybe (although I have my serious doubts), but we're talking quilts here. 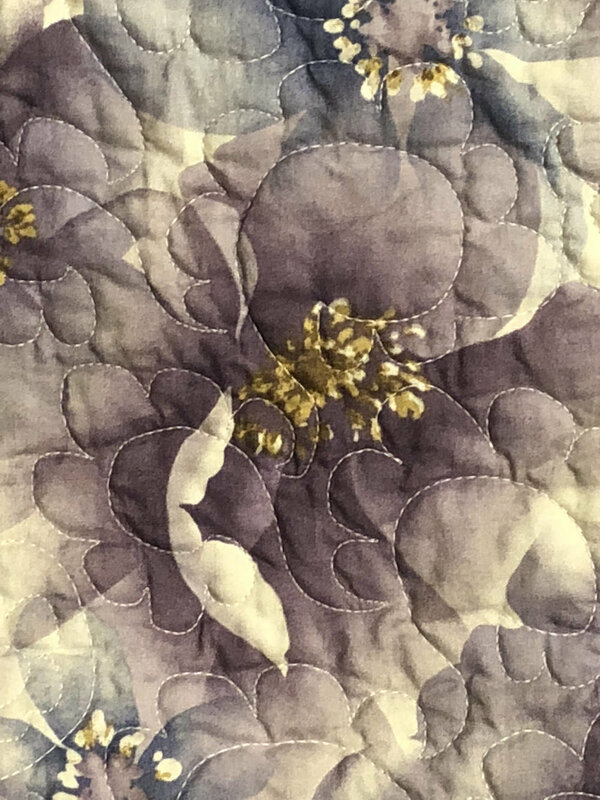 We talk about quilts symbolizing love and care...so what the heck? I also came to the very discomfiting realization that my own attitude changed whenever I worked with those unattractive, often musty-smelling tops. I stopped caring about my own skills. I adopted a very "I don't care, just get 'er done" attitude. Fast and Finished was queen, not Done Right. Which, of course, led to me simply compounding the problem of ugly quilts with shoddy workmanship. And that's to my shame. I'm doing some penance over that one. People don't necessarily need blankets...they can buy blankets pretty dang cheaply at big-box stores these days. Frankly, if my purpose is to provide a blanket, I'd rather write a check. 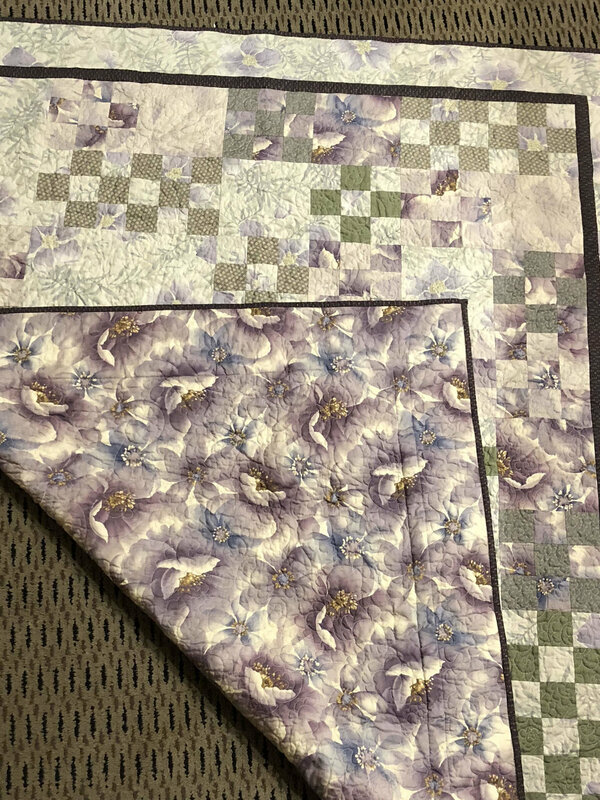 The reason to make a donation quilt is to go that step beyond, provide someone in need with just a little bit more: the thought that someone else cared enough about them in their situation to sit down and make something by hand. But for pity's sake, please make it pretty. I vow never to make an ugly quilt for donation again. I vow to never be attached to making ugly quilts for donations again. I will choose to make my own donation projects from my own beautiful fabrics with an attractive design, not some slapdash thing that "someone ought to be grateful for." I will choose to make something that shows someone I cared enough to take the time to think about it, even if it is a simpler pattern, even if it is a slightly faster style...it's still attractive, and thoughtful. And hopefully, will give them a touch of love and care at a time when they need it most. If I wouldn't want it in my own house, I won't donate it to someone else. Ok, rant done. Sorry--had to get that off my chest. Hope I didn't bug anyone. To purge myself of these negative feelings and bring some Beauty Mojo back to my sewing room, I plan on making a donation quilt from my own fabric before my vacation is done. I'll keep you posted. In "BDSI", "completed", "donation quilts"